I mentioned on the Dreamcast Junkyard Podcast that I was intending to build and sell some special phone cables which add the required voltage for a Dreamcast to connect with a DreamPi setup - official DreamPi cables if you will. At the time I was waiting for a test run of PCBs to arrive, and they have! 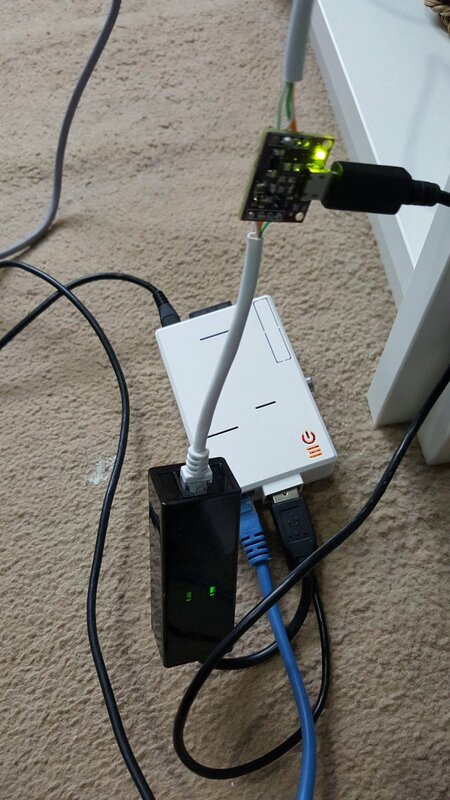 As you can see, the power comes directly from the Raspberry Pi itself providing you have a spare USB socket. I've been forced to test this by playing PSO online for an hour, and I can confirm that the circuit works perfectly! So straight onto manufacturing right? Well.. not quite. Firstly, obviously I don't intend to sell cables with exposed circuitry, so before I sell any cables I need to get some boxes 3D printed. But more importantly, I think I can do better than this. I think it should be possible to create an adapter box that plugs directly into the Dreamcast, leaving you to just connect any standard modem cable. Not only will this be more robust, but also be quicker and cheaper for me to manufacture (the cable costs £3-4 alone for a decent one). The next revision of boards I send off will probably an attempt at this, and as end-to-end design, manufacture, shipping, soldering and testing takes about 3 weeks, I'm afraid I won't be shipping these for a little while. Still, I've proven that it works, and this is a thing I can build. I'll keep you all updated! P.S. This has all only been possible because of the electrical know-how of my mate Rob! This is fantastic news! Any chance you might post your specs so we might be able to take a shot at making our own? Any update on this? Thank you so much for all your time and hard work for the dreamcast scene. I'd love to get my mates all online! Are you still making these ? If so how much. If not any chance of a schematic ?.